I began A Course In Miracles in January 2018 after hearing over and over that we should all be doing it. I'm actually doing it again in 2019 and I recently got the biggest ah-ha moment of my life, which is causing me to make a few tweaks on this site. For anyone new to it, this is a brief explanation of the book and how it came about. Dr. Helen Schucman and Dr. William Thetford were medical psychology professors at Columbia University's College of Physicians and Surgeons. There was a lot of competition, arguing and ego games between them. One day Dr. Thetford simply said, "There has to be another way". They both agreed. It seems that the common ground that they suddenly shared, was sending out the signal that they needed assistance. Helen was not at all spiritual, yet she suddenly began to receive messages from what she called an "inner voice". She knew that it was important and began writing it all down. William would type up the notes. Seven years later, they completed the Course together and it was published in 1976. According to channeled videos, the "voice" in A Course In Miracles was Jesus. This is why the terminology sounds somewhat religious, yet it's not teaching religion. This book is actually for everyone. It's teaching us how to get out of our ego, fear based mind to find peace and love. To discover who we really are. It's meant to get us back on track, by gently changing our false subconscious beliefs. Jesus said: ".....everything is backwards and upside down." I found this very interesting. If you're familiar with Dr. David Hawkins studies of consciousness, A Course in Miracles calibrates at well over 600. Yet the current bible calibrates at 475 as a whole. Just doing the Course raises your vibration. 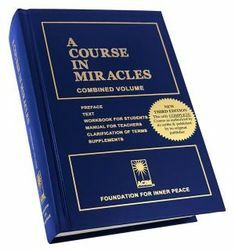 A Course In Miracles is a text, a manual for teachers and 365 lessons, one for each day of the year. This isn't a course where you have to memorize anything. In fact, you don't even have to understand it. You are simply changing or correcting old beliefs in your subconscious by repeating phrases. For example, you are asked to repeat the phrase "My salvation comes from me." That means that you don't need to look outside of yourself for answers. You are your own "source". Looking outside of yourself is giving your power away. I believe that the one thing that stops people is the commitment to 365 lessons. They don't understand that if you miss a few lessons it's fine. Simply start again where you left off. The only request, is not to do more than one lesson each day. You can do it any way that you want. You can just do lessons and read the text after you've completely finished. You can also do a daily lesson and then read a little bit of the text. The important thing is the lessons. It seems that anyone who actually does it agrees, across the board, that it has changed their life. Marianne Williamson, Gabby Bernstein, Eckhart Tolle and Wayne Dyer say that it's the book that "changed it all" for them. Ask yourself how long it has taken to gather all of the ego based untruths that are stored in your mind? You can't change them overnight. This is a guided way to gently change them. If you have a Kindle it will cost you less than $9. There is also a Kindle app that you can get for free, to read on another device. The hardcover book is under $30 (new). For me it was a very small price to pay for a life changing book. If you've read my page about the channelings of Jesus, he's very insistent that we do this. I now know that it's because of ascension. For me, there are parts of the text, of A Course In Miracles that are hard to understand. You really don't need to understand it, but many will feel the need to. This is an important book and I don't want anyone to quit. Miracle is actually the word that I couldn't figure out. In this case it doesn't mean winning the lottery. The miracle here is a correction in your thinking and perception. The miracle is undoing old ways of thinking and seeing the real truth. God can't really be defined in human words, but God is the frequency of unconditional love. If it makes you feel more comfortable, you can replace "God" with Source. Christ is the Son of God. We are all sons, daughters, children of God. Holy Spirit is your inner teacher, the link between all of us. When you read "Holy Spirit" know that it's your inner voice. You is mentioned 18,068 times in A Course In Miracles. Sometimes you are referred to as the ego. There is also you the observer and then you that is the self, the Oneness or The Son/Daughter of God. The ego is a belief or a false interpretation. It is the dream or the illusion of who you think that you are. The ego is based on fear and it is not the real you. The body is the ego's "home". The body is your own creation. The vessel that you are using on this planet. A Course in Miracles will teach you that you are of God/Source. God/Source did NOT create the world or what is external to you. You have created it. "This is the function you have given your bodies eyes. It is not seeing. It is image making. It takes the place of seeing, replacing vision with illusions." As an Amazon Associate I do earn a small commission from qualifying purchases. You might like my page on Jesus which will explain this page and why I feel this book is so important. You may like my page called We Are Vibration. My latest page is about Ascension.